Human Technologies announced the recipients of the sixth annual employee awards on December 16, 2016. The Rose White Community Service Award was presented to Marion Davis, the Colonel James G. Hill Service to our Country and Service to Human Technologies Award was presented to Bob Michaels, and the Donald A. St. Louis Mission Award was presented to Nichole Meunier. The Rose White Community Service Award recognizes an employee for volunteerism. This year’s recipient was Marion Davis. Marion has been employed with Human Technologies since August of 2014, when she was hired as a Janitor. She excelled in this position, but her true wish was to work in customer service or in administration. In January 2015, she applied for and was hired for a clerical position in the Human Resources department. Marion brings fresh eyes to the HR team and has first-hand knowledge of the janitor’s job, where much of our hiring takes place. She speaks knowledgeably to new hires about what the job requires, what it takes to succeed, and how important it is to always work safely and keep an eye out for others. Marion volunteers much of her free time giving back to the community. She is involved with the local chapter of the American Heart Association and was part of the first-ever Go Red Survivor Class. Marion is very passionate about the Go Red for Women campaign and educating others about the number one killer of women, heart disease. 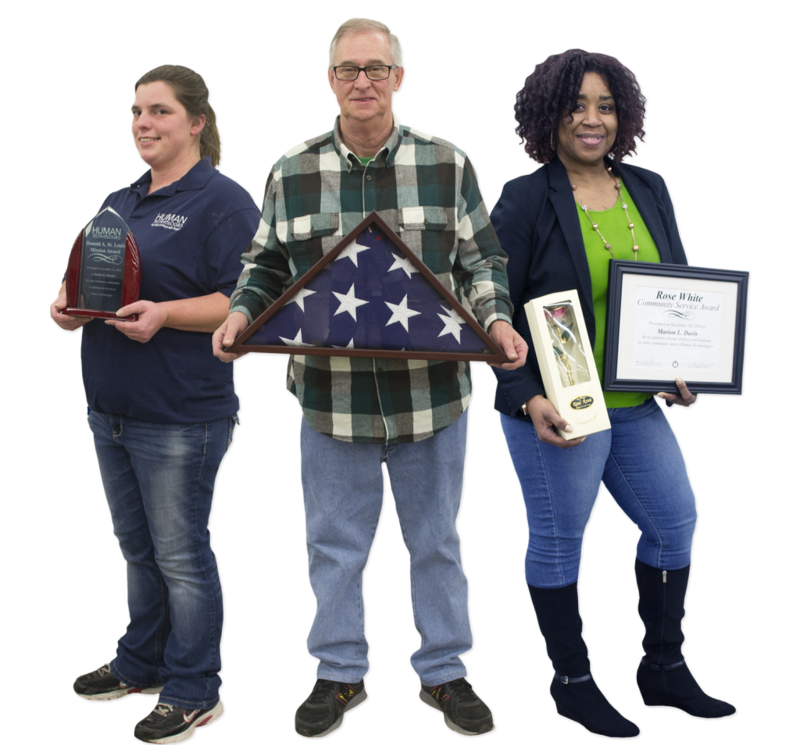 The Colonel James G. Hill Service to our Country and Service to Human Technologies Award recognizes an employee who has served in the military and is dedicated to their work at Human Technologies. This year’s recipient was Bob Michaels. Bob has worked at Human Technologies since the year of 2000 as an industrial mechanic and has been instrumental in keeping the sewing and embroidery machines up and running. Bob is active in our safety program, is part of our First Aid Team, maintains and inspects our fire extinguishers, and trains employees on the proper use of the pallet jack and other production equipment. He also assists with production and helps people learn new production processes and operations. Bob served our country in the Navy from December 1955 through November 1959. He served first in Brunswick, Georgia, followed by two years on the aircraft carrier Tarawa, where one of his many memorable experiences was helping to pull a pilot out of a plane that had been wrecked on deck before it caught on fire. He was also on the Honor Roll for his contribution to the Navy swim team. The Donald A. St. Louis Mission Award recognizes an employee who exemplifies an extraordinary commitment and service to the mission of Human Technologies and especially to people with disabilities. This year’s recipient was Nichole Meunier. Nichole is employed as a cleaning specialist and works at our Dwyer Ave building. Aside from an excellent work attitude and attention to detail, she has done an outstanding job of training people with disabilities from the production area, teaching them how to perform janitorial tasks. She displays patience, professionalism, thoroughness, and dedication to task and mission. The folks she trains, regardless of disability, have been successful. She adapts to each individual’s ability, modifying her training approach accordingly to yield the best outcomes. Nichole does all of this while retaining her pleasant disposition and excellent work ethic. Nichole also helps out in the cafeteria, even stepping in when the café is understaffed, and does whatever is necessary to ensure the needs of our employees are met. She is a member of the Safety Team. Nichole talks the talk AND walks the walk when it comes to making sure she and her fellow employees are working safely. Human Technologies is truly blessed to have Nichole as a model of “The Power of People with Purpose”. These awards were created in the names of Rose White, Donald A. St. Louis, and Colonel James Hill. All three volunteered several years as members of the Human Technologies Board of Directors. Upon their retirement from the board they were named Directors Emeritus.